This week in chat, a mother asked an increasingly common question, “I am wondering what to do about my 7 year old who will not eat any meat or poultry. She has it in her mind that it is mean to kill animals and eat them.” As a child grows, we want to support her conscience. This means teaching her to listen to it, and to observe and learn from the results. A healthy conscience teaches children both the value of others and the value of themselves (you count and I count). 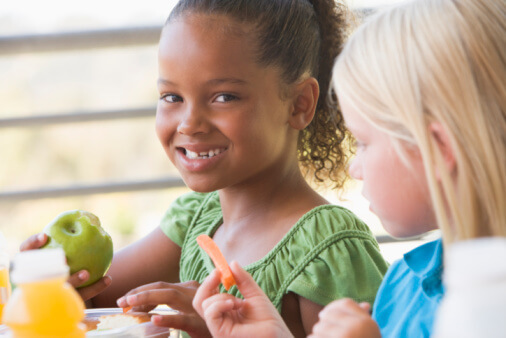 A vegetarian diet can be a wonderfully healthy choice for children. Kids can get all they need to grow and thrive while honoring their concern for animals. Most kids easily get plenty of protein. As with all children, you’ll want to be sure she gets enough calcium (800 mg till she reaches age 9, then 1300 mg). Also, a multivitamin with iron is a good idea (to avoid B12 deficiency), but even without that, most vegetarian kids seem to eat better than their peers. There is an explosion of recent books on the topic to help you and your daughter both to learn more about vegetarian kids My daughter made a similar choice for similar reasons. And I’m glad.